Carlos Carrasco's illegal quick pitch in Seattle, umpire John Hirschbeck's crew presiding, prompted a brief delay during Wednesday's Indians-Mariners game as the crew convened and ultimately returned batter Kyle Seager to the plate (Seager had swung at the 1-2 quick pitch and grounded to the first baseman). The following analysis paints a picture of what HP Umpire Mike Muchlinski, 1B Umpire and Crew Chief John Hirschbeck, 2B Umpire DJ Reyburn, and 3B Umpire Bill Welke considered, discussed, and called. Diagram of F1's disengagement quick pitch. By standing on the mound with his pivot foot (right foot) in contact with the pitcher's plate and his free foot (left foot) in front of it, holding the ball in both hands, Carrasco used Set Position, one of two legal pitching positions. Although Rule 5.07(a) states that, when using Set Position, pitchers shall complete to a complete stop before committing to home plate, the one exception is that with no runners on base, as was the case during Seager's at-bat, the complete stop is not required. However, Rule 5.07(a)(2) Comment portrays a key consideration for the stop exclusion: "If, however, in the umpire’s judgment, a pitcher delivers the ball in a deliberate effort to catch the batter off guard, this delivery shall be deemed a quick pitch, for which the penalty is a ball." 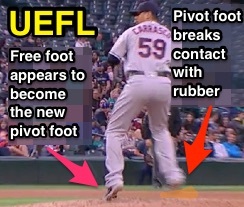 Replays indicate Carrasco not only attempted a quick pitch, he also illegally disengaged the rubber, his pivot foot (right foot) landing behind the pitcher's plate while his free foot (left foot) appeared to stay put in its position in front of the plate. Thus, after the umpires convened, Seager was returned to home plate, with a second ball added to the count. Carrasco could have been called for either a quick pitch OR an illegal pitch for illegal disengagement from the rubber. Note that a quick pitch is a subset of the greater category that is "illegal pitch" (Rule 6.02(a)(5): "A quick pitch is an illegal pitch"). NOTE: Rule 6.02(b) states, "If the pitcher makes an illegal pitch with the bases unoccupied, it shall be called a ball unless the batter reaches first base on a hit, an error, a base on balls, a hit batter or otherwise." Thus, had Seager reached first base, the achievement would stand. This could explain why play wasn't immediately killed.